The SEAT Leon CUPRA 300 has been confirmed as the official car of the Ducati MotoGP Team. 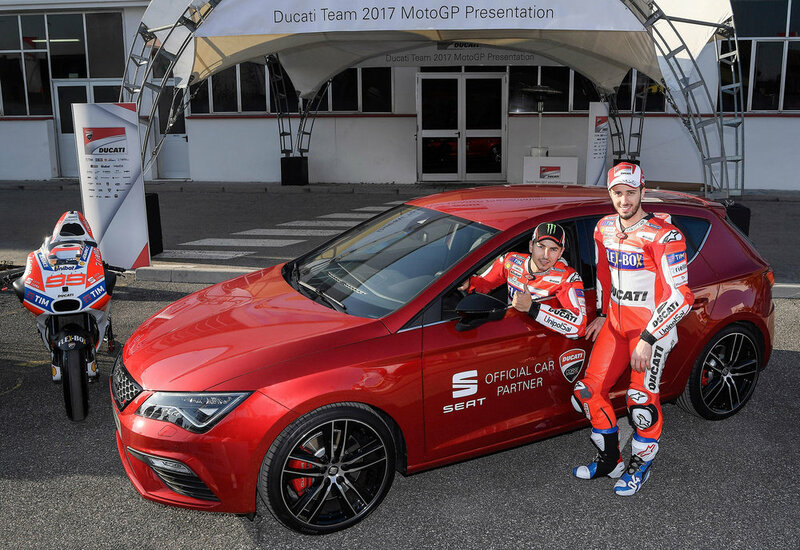 Ducati Team riders Jorge Lorenzo and Andrea Dovizioso were on hand to celebrate the partnership which will see the most powerful SEAT model accompany the team to the 18 MotoGP races. The agreement also includes the placing the SEAT brand logo on the front of the Italian manufacturer’s motorcycle, as well as on the racing leathers of the riders and team member uniforms. SEAT and Ducati are described as sharing values such as “dynamism, passion for design and commitment to innovation and technology”, according to SEAT Sport Head of Strategy, Business Development and Operations, Antonino Labate. He said: “These values are a mainstay of the SEAT Leon CUPRA which will be making its debut as the official car of the Ducati Team in March at the night-time race on the Losail circuit in Qatar,” he added. The official Ducati Team car - the SEAT Leon CUPRA 300 - is the most powerful and also the fastest model yet, as it accelerates from 0 to 62 mph in just 4.9 seconds. The new CUPRA 300 is set to reach dealerships in March. The MotoGP World Championship, which is scheduled to make its season debut on 23 March in Qatar, will feature a total of 18 races in 15 different countries on four continents.